This day brings back ten year old memories of a beautiful sunny morning. I was in the garden cutting flowers to make a bouquet to place in my Uncle’s casket. His funeral was to begin at 1100. I walked back into the house and saw on TV the second plane hit the Tower and knew immediately our country was at war. Uncle Steve was a World War II Army Veteran. His Honor Guard that day included young men and women from all branches of the military. I remember thinking to myself as they folded the flag that covered him, “They will be going to war.” A few months later, we went to Afghanistan. Our volunteers knew that many of the young men and women we would be serving were eight, nine, ten years old when the Twin Towers, the Pentagon and Flight 97 were attacked and thousands of innocent Americans were murdered. We are very grateful to the Easton Rotary Club of Easton, MD for their sponsorship and help serving this luncheon, and to Touch of Relief for their soothing seated massages provided to family members and patients. I met with the Rotarians who would be joining us – Jackie, Doug, Tim, Connie, Maureen, and Patti a month before the event, filling them in on whom we would be serving, what to expect, and explained our Code of Conduct, which all volunteers joining us are expected to follow. 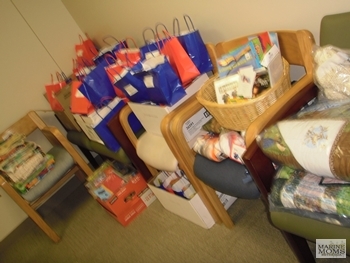 Under Jackie’s guidance, the Rotary Club had already begun collecting items for the pantry bags. They planned the menu that day with a few minor suggestions from me. Doug took it from there. They decided on “football food”. Menu: Buffalo Chicken Wings w/ celery and carrot sticks, blue cheese and ranch, Nachos w/Salsa, sour cream, cheese sauce, Creamy Potato & Cheddar Soup (okay this spilled on the trip over but it did look good! 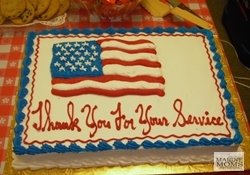 ), Chips, Pretzels, Dip, Chicken Chili w/ cornbread, Grilled Hot Dogs, BBQ Meat Balls, Garden Salad, Fresh Fruit Salad, Mama’s Mac and Cheese, Red Potato Salad, Baked Beans, Fudge Brownies, Assorted Cookies, Red ,White and Blue Jell-O Shooters, Patriotic Cake, and Assorted Drinks. We added in smoothies, pickles, olives, and cheese platters, and PB&J sandwiches. Our plans were set. I wanted as many details as possible covered and in place before the day of the luncheon, anticipating that the security was going be extremely tight on the 11th. I spoke to the SSgt. on Tuesday to ensure he had received the gate roster, and to make sure there would be a parking space for the truck Doug was bringing since it wouldn’t fit in the parking garage. I had also heard some things and wanted to double check about those. He confirmed. I laid out plans with the volunteers to serve lunch on the 5th floor, set up a small smoothie table on the 4th floor, station a massage therapist on both floors, and have volunteers floating between both floors ensuring that all of the wounded and their families were served. Yes, Walter Reed and Bethesda had combined! The “Semper Gumbiness” had begun! Last minute emails to the MM-B volunteers asking them to bring some things to accommodate the new plans. Last minute emails to the Rotary Crew with updates. Last minute emails to the SSgt. More last minute emails to all of the volunteers on Friday. Saturday morning I stopped by the Tidewater Inn where Jackie, Doug and their Crew were doing the prep work to drop off my three crockpots. Becca, from the “Star Democrat”, was there doing video interviews with everyone. I’m looking forward to seeing the finished piece! In the meantime Janet was in Virginia printing out the “Note 4 Bethesda”. All but your cover letter is printed. My stapler will not go through 38 pages (and I have a heavy duty long extension one) so the notes/pages will have to be placed in loose. They are numbered — in case they fly out they can be put back in order. My printer got a work out this week; 2,067 pages printed for the notes at Bethesda. If inanimate things could express emotion, I’m sure it would be expressing pride. We had encouragement notes from all over the United States as well as the UK, Sweden, China, and Australia! On Sunday morning, here on the Eastern Shore of Maryland, we woke up to pea soup fog – the kind that causes a 2 hour school delay; the kind you don’t travel in if at all possible. We had chosen a place to meet to caravan over and were able to leave to get to the hospital in plenty of time, the fog lifting after we crossed the Bay Bridge. It was very strange to see Soldiers at the security gate. We’ve been used to seeing the crisp, sharp Navy MPs on duty. 😉 Security was at THE highest level Sunday. The Soldiers did their job! Janet and Lew’s car broke down on the way so Janet called a friend who has base access. She picked Janet up and brought her over with the stuff she had for the luncheon. Unfortunately, Janet’s photo ID was still in her car and they wouldn’t let her on base, so Janet waited at the gate, while Paula met Elizabeth and passed things on to her to bring upstairs. 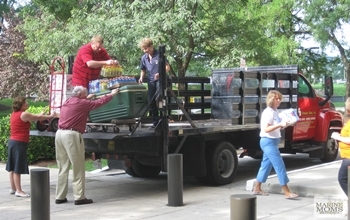 Unloading the truck in front of the hospital. Some glitches that were totally out of our control were overcome by the wonderful MM-B volunteers, Rotarians, Marine Liaison staff, Corpsmen, hospital staff, and Jamie and Kelly, the massage therapists from Touch of Relief. 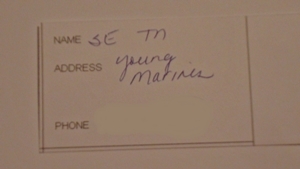 I guess things had changed since I had spoken to the SSgt. 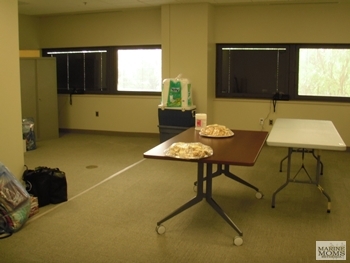 There is a brand new conference room on 4 East we were able to set up in. It also turned out that the patients were not separated by service branch between the two floors. 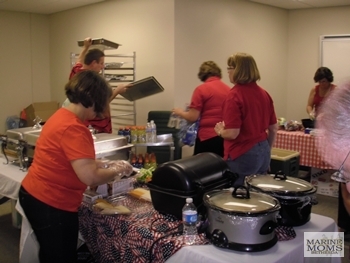 But we moved everything down, set up, and began serving about a half hour later than planned. It was worth the move back down a floor. Much more room! We were able to set up with plenty of space for the wheelchairs that came through. Setting the luncheon room up. At one point, I checked in with Jaime and Kelly, the massage therapists. Kelly was massaging a Marine mom. Jaime was massaging her son, a double amputee, in the massage chair. When I checked in another time one of them had just finished a gentleman who looked like he was in his late 70’s, early 80’s, there taking care of his wife who was a patient at the hospital. He was pushing her around the hospital in her wheelchair when they found us…. He looked like he had died and gone to Heaven when he walked out of the massage room…. There was a group of 11 boys, young men in their mid to late teens, plus their sponsor, most in high school, from New Jersey, who came in for lunch. 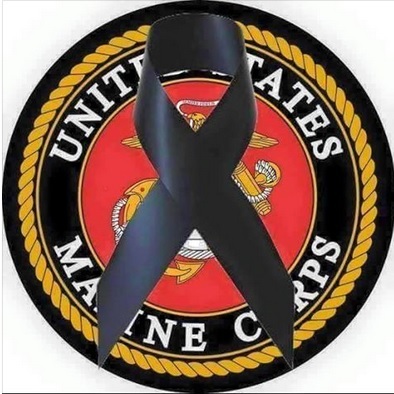 While they were sitting in the chairs in the hallway, I asked them where they were from, why they were they there, thinking maybe they were Poolees with a Recruiter on a field trip, or with a Young Marines group. They were part of a “Police Explorers” group visiting one of their friends, a Marine, who was wounded in ‘stan… lost both of his legs. I thanked them for visiting him and told him I was sure it was a tremendous morale booster for the Marine to have visitors from home. Janet had sent a plate of Rice Krispie treats she had made for us to pass onto a Marine who had served in the same Battalion as her son. His face lit up when he saw them! His favorite! Jackie passed out the pantry bags and quilts. Connie made the smoothies. Tim just kind of stayed in the background after things got rolling, taking everything in, which reminds me, I never did get a taste of his wife’s brownies! There wasn’t a crumb left of them! 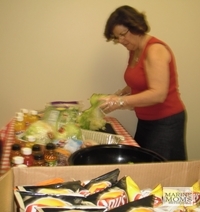 Pattie and Maureen kept the food going after Doug got everything set up with Katie and Elizabeth’s help. Stephanie kept track of the headcount. Somewhere along the line Elizabeth made sure the families in ICU were invited up. Everyone pitched in and helped where they saw a need. The MM-B volunteers and Rotary Club members worked extremely well together. 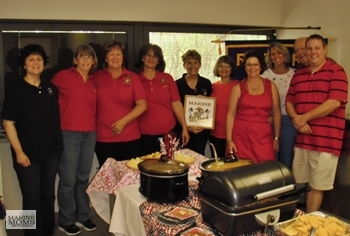 Jackie, Doug, Tim, Connie, Maureen and Patti have the same kind of “heart” as the Marine Moms-Bethesda volunteers have. It was a pleasure working with them! Marine Moms-Bethesda and Easton, MD Rotarians, Sept. 11, 2011 luncheon crew at Water Reed/Bethesda. The patients and families…. some remembered us from previous luncheons, some were new, all were grateful and appreciative. I am so thankful for the wonderful out pouring of support for this luncheon from our volunteers, the Rotary Club, Touch of Relief, and the community. I would like to share a few of my favorite quotes with you. 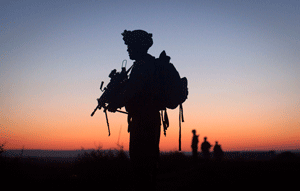 You volunteered to serve our country during a time of war. Thank you for being a Defender of Freedom. We honor you. Headed home, on the East side of the Bay Bridge, September 11, 2011. What a beautiful sight to see! 4th Floor9/11Support the Troops at Walter ReedThank You! 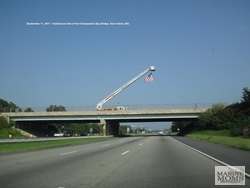 Previous PostAugust 21, 2011 – Richmond PTRP: Headed South!Next PostOctober 9, 2011 – 4 East: Busy, Busy, Busy!